Admissions open for the academic year 2019 at Amrita Health Sciences Campus, Kochi. Amrita School of Pharmacy (Accredited by National Board of Accreditation - NBA). The online registration starts for B. Pharm. (Regular & Lateral) Course from 02nd April 2019. Amrita Vishwa Vidyapeetham Kochi has various institutes- Amrita Institute of Medical Sciences (AIMS) along with the School of Medicine, School of Dentistry, School of Nursing, School of Pharmacy & School of Allied Health Sciences Center for Nanosciences, Amrita School of Arts and Sciences and Amrita School of Business. The curriculum is as approved by Amrita Vishwa Vidyapeetham (University) and is in line with the directives of the Pharmacy Council of India. Candidates should have passed in 10+2 with 50% marks in Physics, Chemistry and Biology. In place of Biology, Biotechnology or Computer science or Maths are also eligible. Candidates should have minimum 17 years of age and maximum 23 years on or before 31st December 2019. Candidates should have passed in 10+2 with 50% marks in Physics, Chemistry and Biology. In place of Biology, Biotechnology or Computer science or Maths are also eligible. Pass in Diploma in Pharmacy (D.Pharm). 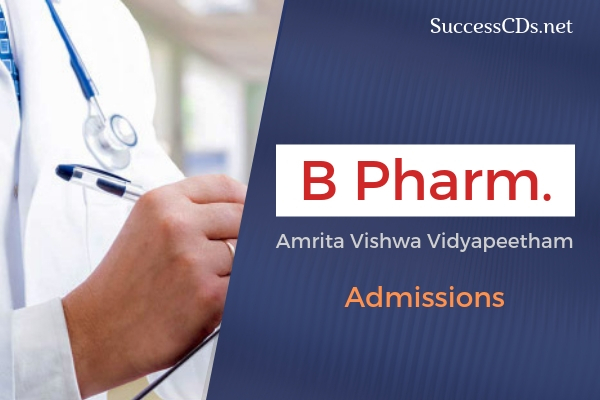 Candidates can apply for B. Pharm Admission 2019 at Amrita University by filling downloaded application from the official website www.amrita.edu.